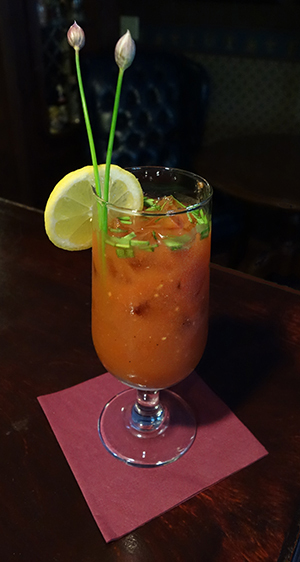 This refreshing version of a Virgin or Bloody Mary features chives and fresh tomatoes, and was a hit at the 2014 Herb Tour. Cheers, everyone! Freeze grape tomatoes. To prepare drinks, place frozen tomatoes, half the tomato juice, chives, lemon juice, Worstershire sauce, horseradish, Tabasco, and sea salt in a blender container. Blend until all ingredients are smooth and frosty. Add remaining tomato juice and pepper to taste and blend again. Pour into glasses and garnish each with chopped chives and a lemon wheel. Serve immediately. *For a Frosty Bloody Mary, add pepper or citron vodka. If using pepper vodka, do not add pepper to the tomato mixture.